Selections from the installation The Prepaid Piano, recorded 21–24 February 2013 during the Unmenschliche Musik/Inhuman Music exhibition at Haus Der Kulturen Der Welt, Berlin. Inside a grand piano, five mobile tele­phones rest directly on the strings in five different areas of the piano soundboard. Calling any one of the telephones activates its vibration alarm, thereby directly ‘play­ing’ the strings on which the phone happens to be lying. Audience members choose which parts of the piano are ‘played’ by calling any of the five telephones’ numbers — either from their own mobile phones or from the provided stationary telephones. Contact microphones attached to the piano’s soundboard pick up the sounds of the mobile phones vibrating the piano strings and pass them on to a voltage-controlled modular synthesizer. Incoming signals above a pre-determined amplitude threshold at the synthesizer’s input trigger its recording and modulation functions. The incoming audio is looped and modulated by the synthesizer and played back through stereo loudspeakers. Subsequent calls to the phones produce new incoming signals that gradually displace the previously recorded audio. Additional layers of sounds are added by intermittently tapping and knocking on the piano, manipulating its strings directly, repositioning the mobile phones, etc. Co-published by Entr'acte and Senufo Editions, 2014. A few years ago I wrote an essay about how experimental music can be really funny, even when – sometimes especially when – it’s serious. Andrew Pekler’s work is proof. He investigates some heavy sonic concepts, but there’s always a sense of play and absurdity running though his music. Follow his winding lines closely and they become a series of set-ups and punch lines, or a collage of wordless puns. 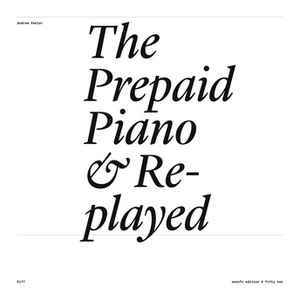 The title of his latest project, The Prepaid Piano, is a literal pun, playing off the serious concept of Prepared Piano (i.e. piano altered by placing objects inside it). But it’s not just a funny line. It reflects Pekler’s process of placing prepaid cell phones inside a piano, which vibrate the strings when the audience calls them. The result is bubbling, cartoon-ish music that’s also eerie, dramatic, and evocative. There are echoes of electronic music’s original prankster, Raymond Scott. But Pekler has a unique brand of sonic alchemy, which plays even better on side B, Replayed, where he ultra-MIDI’s the sounds from side A. He sees humor where others might see seriousness and vice versa, and that uncanny vision makes The Prepaid Piano & Replayed one of the best albums of the year.